Americans are increasingly turning to social media for news and political information and to encourage others to get involved with a cause or movement. Social media also can serve as an important venue where groups with common interests come together to share ideas and information. And at times, Twitter, Facebook and other social media sites can help users bring greater attention to issues through their collective voice. In recent years, these platforms have provided new arenas for national conversations about race and racial inequality. Some researchers and activists credit social media – in particular, Black Twitter – with propelling racially focused issues to greater national attention. In fact, two of the most used hashtags around social causes in Twitter history focus on race and criminal justice: #Ferguson and #BlackLivesMatter. In addition to social and political issues, social media also serve as places where conversations about race intersect with a number of issues, including pop culture, sports and everyday personal experiences. 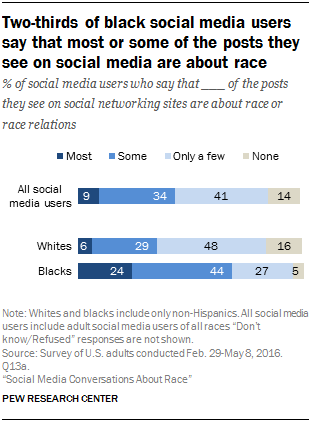 A new Pew Research Center survey finds significant differences in the way black and white adults use social media to share and interact with race-related content1 And a Pew Research Center analysis of tweets reveals that key news events – from Baltimore, to Charleston, South Carolina, to Dallas – often serve as a catalyst for social media conversations about race. In addition to the survey data, Pew Research Center conducted three content analysis case studies using publically available tweets. 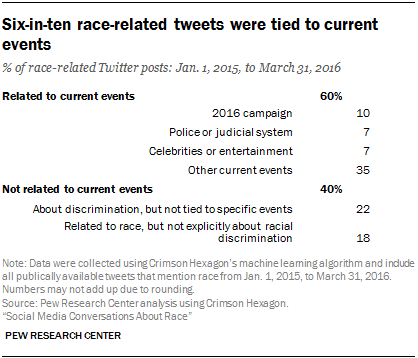 The first analysis found that over a 15-month period (from Jan. 1, 2015, through March 31, 2016) there were about 995 million tweets about race – or, on average, 2.1 million tweets per day on the subject. By contrast, about 500 million tweets in total were posted on Twitter each day in 2015, meaning that tweets mentioning race made up about 0.04% of all tweets posted. The third case study examines the Twitter conversation following the deaths of two black men at the hands of police and the shootings of police officers in Dallas and Baton Rouge, Louisiana. This time period – July 5-17, 2016 – had the hashtags of #BlackLivesMatter, #AllLivesMatter and #BlueLivesMatter used more often than any other time since the hashtags began appearing on Twitter in July 2013. And almost overnight, the tone of the online conversation around #BlackLivesMatter shifted following the attacks on law enforcement. There was a dramatic rise in the share of tweets criticizing the Black Lives Matter movement using that hashtag in our July analysis and a drop in the share of tweets that supported the movement. The rise in critical tweets was especially notable after the killing of police officers in Dallas. The survey findings are based on a national survey of the general public conducted by landline and cellular telephone from Feb. 29-May 8, 2016, among 3,769 U.S. adults. In this survey, 64% of all adults reported they are social media users5 That figure includes 62% of white adults who are social media users; 63% of blacks who are social media users; and 63% of Hispanics who are social media users. This report focuses on the subpopulations of each racial and ethnic group who are social media users, rather than the entire adult segment of each cohort.